ttend Vanderbilt University. The only problem? This is probably the tenth college brochure I've received in the past two weeks, all full of normative statements about the large amount of utility students get from attending the advertised school, all claiming my worth as human capital will be exponentially increased should I attend whichever college the brochure represents. I finally overcome my reluctance and open the packet, only to discover exactly what I knew I would find: yet another potential college further confusing my decision of where I should go. 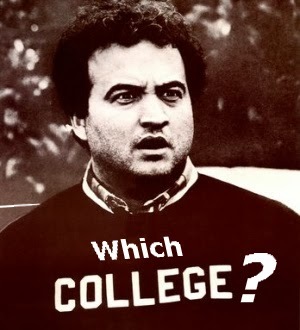 First, of course, before I can even begin to decide which college I should attend, I must decide if the opportunity cost of going to college is lower than that of not going at all. Time, especially a student's time, is a scarce good. We are at the age where there are countless other things we could be doing besides trying to find a college we want to attend and then spending the remainder of our high school years trying to get into it. Many students don't find the opportunity cost of even this much work towards a college education to be worthwhile and they stop their educational career as soon as they receive their high school diplomas, or sometimes sooner. Others see fit to get by on a degree from a community college, or they try their hand at a trade school, trying to specialize in the production of a particular service or good to give themselves a comparative advantage in the production of the thing of their choice. Although it will be a lot of work, and it will be a high opportunity cost, I consider the opportunity cost of going to college to be less than that of not. This is partially because it is my hypothesis that people who don't go to college have to work much harder later on in life than those who do go to college. While this is by no means a scientific law or even a theory, it is a phenomenon that I have observed in the lives of several of my friends and family members, and it is something I do not wish to see repeated in my own life; lazing about through high school, always bored or getting into trouble, only to still be performing manual labor for minimum wage at almost sixty years old. I want something better than that. Now comes the opportunity cost that most students think of when they think about college: the opportunity cost of the things students must do to prepare for the major of their choice. As a high school junior, I have to consider this almost daily as I evaluate which classes I should take next year, what work opportunities I should try to achieve, and what colleges I should make a priority to visit. For example, this year I was offered the chance to apply for an internship at NASA with my physics teacher. Even though this would be an amazing opportunity for me and it would look great on a transcript, I had to turn down the offer because I know that I want to major in pharmacy in college, and an internship in a field that deals more with medicine would look better for me than an internship that focuses on physics and engineering. In the same way, I have to focus on visiting schools that offer good pharmacy programs, and I have to find classes that are going to help me be as far ahead as I possibly can be when I reach college. Some students don't find it worthwhile to go through all of this work to plan what they are going to do in coming years, but I think that for any student serious about what they want to do later in life, this planning is completely worth the opportunity cost. The final opportunity cost of the college decision is the most obvious, and probably the most worried over one. It is the opportunity cost of the actual college that you decide to attend. Though I have some time to think about this before I graduate, it is still always in my mind and I am sure it will most likely become a source of great stress for me before I make my final decision. Many components make this decision extraordinarily difficult, the atmosphere of the college, how large it is, what the dorms are like, how prestigious it is, and how much money they will be willing to give me in scholarships and financial aid. Every student wants to find a college that will give them the best of all these things, but usually they have to sift through many colleges to find even one that offers a few of these aspects the way the student wants them to be. Often, even when a student finds a college they love, there are enough things about it that they don't like, can't afford, or are giving up as compared to other colleges that the opportunity cost is too high for them. I would love to go to the University of William and Mary because they are very prestigious, have excellent academics, and have a beautiful campus; however, they are unlikely to offer me a scholarship and they may not offer minors in dance, so the opportunity cost to go there may be too high. If I were to get a scholarship there though, the opportunity cost would be lowered and I would be more likely to go there. In summary, there are three major opportunity costs associated with the college decision: the opportunity cost of going to college; the opportunity of preparing for college; and the opportunity cost of the particular college a student decides to go to. Students must evaluate all three of these opportunity costs in order to be able to make the best decision they can for themselves. While I personally believe that every student should make the decision to go to college, work hard, and try to get into the best school possible, that isn't always the best or most favorable path for everyone. That is why all students must go through this process for themselves to decide if the opportunity costs of college education are too high. Michaela is a high school junior who enjoys volleyball, soccer, and ballroom dancing. She has been playing the piano for almost eight years, and she greatly enjoys it. She even plays in a small band with some friends of hers! She has five cats, two parakeets, four chickens, a cockatiel, and a brother (whoops, that's not a pet...). She loves all of her classes, but her favorites are Physics and AP Calculus (math and science person!). She is currently working at her local pharmacy, and she couldn't imagine a better job. Her goal is to graduate college with a pharmacy major and either a dance or business minor.